SDOT is asking the Seattle City Council to approve an operations and maintenance agreement that lays out the future roles of the city and state following completion of the State Route 520 West Approach Bridge South replacement that will come with added public amenities. 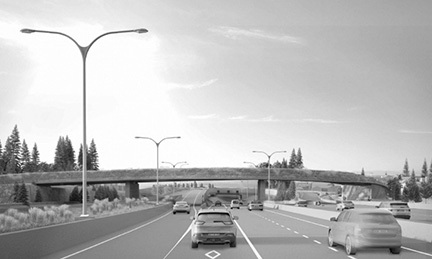 The Montlake Phase of the SR 520 Bridge Replacement and HOV Project will demolish and reconstruct a West Approach Bridge South for eastbound traffic that will connect to the floating bridge over Lake Washington starting in 2019. The City of Seattle and WSDOT entered a memorandum of understanding in 2011 regarding a preferred design alternative that included a lid over 520 that will provide public open space, as well as a bicycle/pedestrian land bridge east of the lid that connects the Washington Park Arboretum and East Montlake Park. Part of that MOU committed the city and state to reaching an operations and maintenance agreement that divvied up the responsibilities between WSDOT and Seattle departments. The intersection of Montlake Boulevard East and East Lake Washington Boulevard will be completely transformed during the Montlake Phase of construction, with new SR 520 on- and off-ramps, regional bus stops and traffic lanes, and a Montlake lid that will also serve as a transit hub. Montlake Boulevard is a city street operating as a state highway (State Route 513). The lid grew out from city and community support, including from the Seattle Design Commission, Layzer said, and will be maintained by the city under the O&M agreement. Seattle Parks and Recreation will be in charge of maintaining the project’s various open spaces, not including the SR 520 Trail. WSDOT would pay the city $12,200 per acre per year for landscaping. WSDOT will maintain and operate most of the structures related to the project. Among the city’s other responsibilities under the proposed agreement are improvements and maintenance of drainage, irrigation and conveyance systems within local trail connections and landscape areas extending from the land bridge to 24th Avenue, as well as drinking fountains and bicycle and interpretive signage and street intersections. WSDOT will operate a North Stormwater Treatment Facility, and Seattle Public Utilities will handle additional runoff diverted between Montlake Boulevard and 24th Avenue East, as wells as a South Stormwater Treatment Facility. Graham Contracting was tapped to design and build the Montlake Phase of the project, having submitted the lowest qualified bid, which was still $30 million over what had been budgeted. Construction is expected to begin in spring 2019 and take 4-5 years to complete, said Dave Becher, WSDOT 520 Program construction director. Drivers will be moved to the East Approach Bridge during construction, which will be converted to two lanes in each direction with a narrow shoulder and no HOV lanes. The bridge portion of the project should be completed by 2023, Becher said. “Throw that into the mix on that period-of-maximum-constraint fun that we’re having,” said Seattle City Councilmember Mike O’Brien. The Sustainability and Transportation Committee approved sending a resolution for the agreement to go to council during its Dec. 18 meeting. The full council will vote on the agreement on Monday, Jan. 7.